Arf! My name is Pickle (A111226) and I am an eight-month-old miniature pinscher. 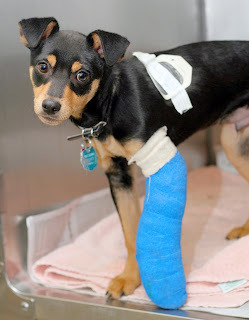 My name is pretty apt, because I sure found myself in a pickle when I recently broke my leg. My owner couldn’t afford to pay for the treatment, so a rescue agent from the Ottawa Humane Society (OHS) came to pick me up from the vet. I was pretty scared when I first arrived at the OHS, but the veterinarian calmed me down, and gave me some pain medication to make sure I was comfortable. She examined me, and set my leg in the hopes it would heal properly. 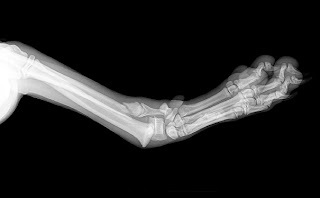 My leg was set, and even though the cast was a bit uncomfortable, the vet explained that it was necessary in order for my leg to heal. I spent the next two months resting and being seen regularly by the vet to make sure my progress was on track. Luckily I was able to recuperate in the home of a kind foster volunteer who was able to give me all the love and attention I needed! The veterinarian told me that I am getting better, which makes me very excited, as I can’t wait to start looking for my new forever home! Please help Pickle, and other animals like him in need of emergency animal treatment, by making a donation.